T-R PHOTO BY THORN COMPTON - South Tama County senior Jonathan Castrejon (9) celebrates after scoring his first of three goals in the Trojans’ 3-0 win over Independence in Tama on Thursday. 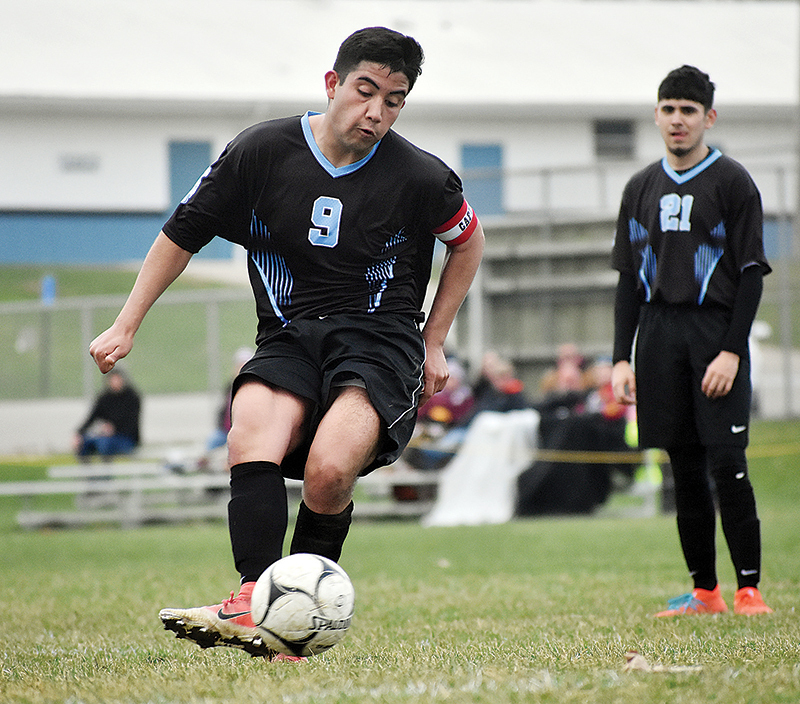 TAMA — While storms in the area subsided in time for the South Tama County boys soccer team to get in its home WaMaC Conference match against Independence on Thursday, Jonathan Castrejon brought the thunder early. Castrejon put the Trojans on the board with a goal in the eighth minute, then eight minutes later he found the back of the net on a sliding kick around Mustang goalkeeper Rito Mino to give the Trojans a 2-0 advantage. Neither team would score again until Castrejon got a chance for a penalty kick due to handball by Independence in the box with less than four minutes remaining, and he sunk that shot for his first hat trick of the season as South Tama rolled to a 3-0 victory. Castrejon said even though the game was all but solidified before his penalty kick, butterflies were still fluttering in his stomach. 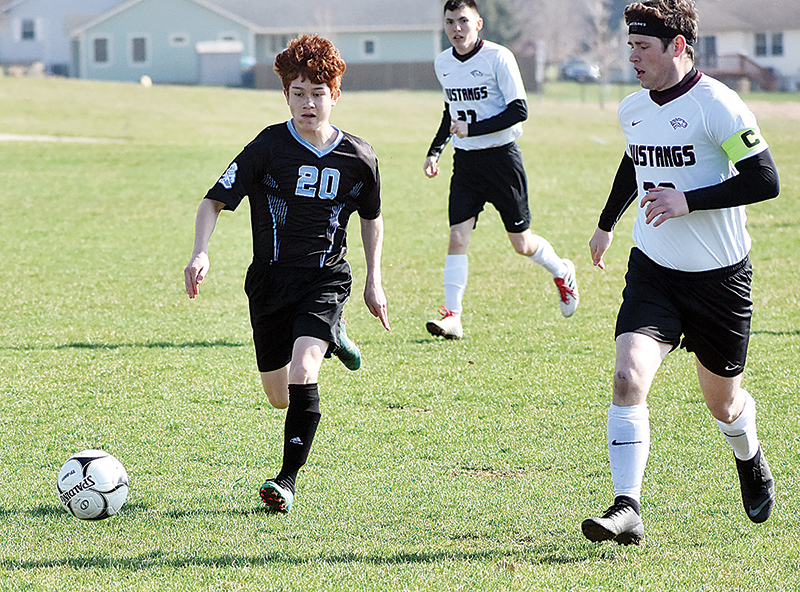 T-R PHOTO BY THORN COMPTON - South Tama County junior Osmar Galvez, middle, splits Independence defenders Jesse Ludwig (25) and Alex Harris (14) during the first half of the Trojans’ 3-0 win over the Mustangs in Tama on Thursday. The win was the second-straight for STC (2-2), and the previous win came against Dyersville Beckman, who just jumped to No. 2 in Class 1A in the latest rankings. 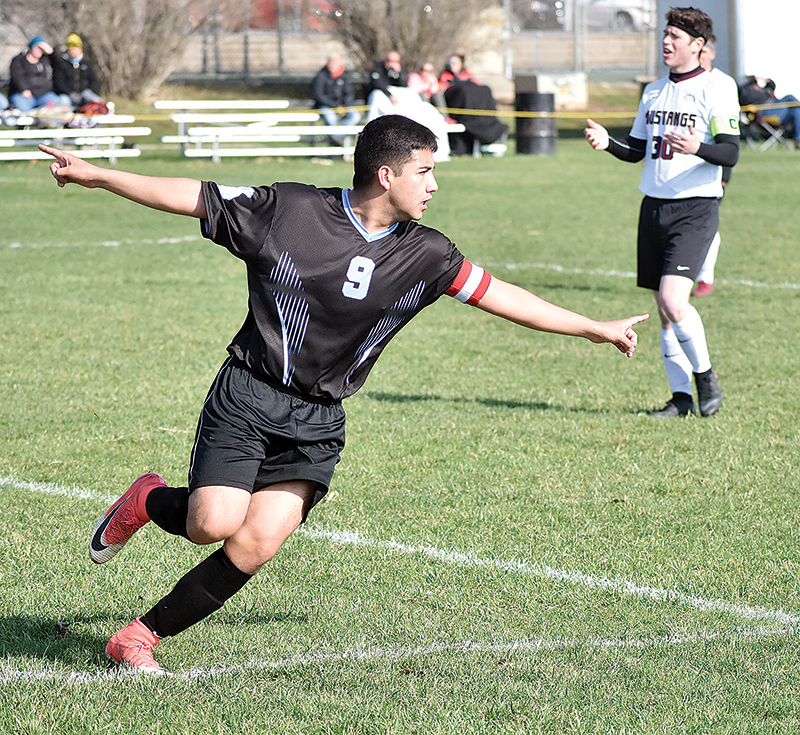 After an 0-2 start to the year, Trojan head boys soccer coach Nate Van Dyke said his guys have continued to climb. The first half was an offensive display by the Trojans. Aside from Castrejon’s two goals, South Tama dominated both possession and shot opportunities throughout the first 40 minutes. By halftime the Trojans had outshot the Mustangs 11-4, including a 5-3 on shots on goal, and two of those shots for Indee (3-3) came in the final five minutes of the half. Van Dyke said his team isn’t necessarily made up of players who have traditional team soccer training, but they are all skilled with the ball and know how to keep it. 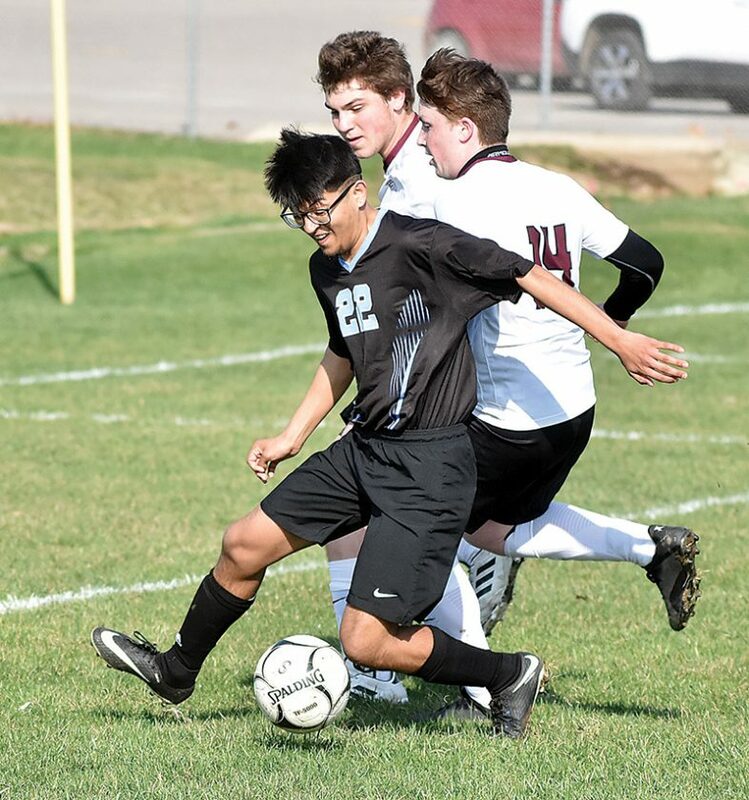 T-R PHOTO BY THORN COMPTON - South Tama County senior Jose Solis (22) dribbles the ball into the box against the Independence defense during the first half of the Trojans’ 3-0 win over the Mustangs in Tama on Thursday. Though it was Castrejon who had all the scoring opportunities, it was his midfield teammate Jorge Davila who controlled the ball from the center of the action. Van Dyke said that one-two combo of Castrejon and Davila in the middle is part of what makes his team so dangerous. In the second half Independence was able to muster more of an attack, even possessing the ball for most of the time between the 50th and 70th minutes. 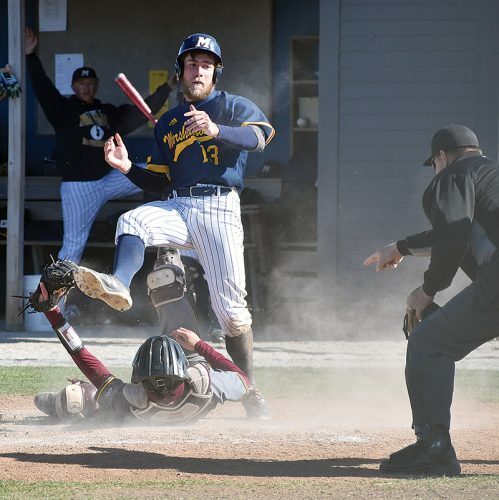 For every attack that the Mustangs built, however, the Trojans had an answer. The defensive backline of Padilla, Jaime Angel, Andrew Laybon and Jeffrey Fuentes played strong on the ball and disrupted the Independence offense, and Van Dyke said any time his freshman goalkeeper Guillermo Garcia doesn’t have to work too hard his defense has done its job. “All four of them did a good job, Jeffrey was playing out of position because we’ve got one of our center-backs kind of dinged up, but he played that position last year and stepped in and did a really good job there tonight,” Van Dyke said. Though he wasn’t challenged too often, Garcia did record five saves to secure the shutout. Through four games now, Castrejon has nine goals and has scored at least two in each of the first four games. 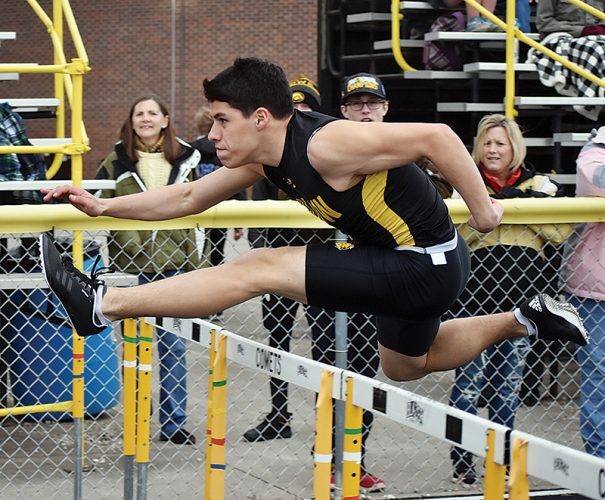 Van Dyke said scoring isn’t even the best thing his senior captain brings to the team. Castrejon said it’s easy to lead a team when he enjoys playing with the guys so much. With back-to-back wins against quality opponents, Van Dyke said his team should feel good about its performance but now is no time to rest. The Trojans next host 1A No. 10 Benton Community on Tuesday, starting at 4:30 p.m.
STC — Jonathan Castrejon (Osmar Galvez), 7:31. STC — Castrejon (Jorge Davila), 15:24. STC — Castrejon (PK), 76:54. Goalkeepers — IND: Rito Mino (11 shots on goal-8 saves); STC: Guillermo Garcia (5-5). Shots — IND 10, STC 18. Shots on Goal — IND 5, STC 11. Corner Kicks — STC 6. 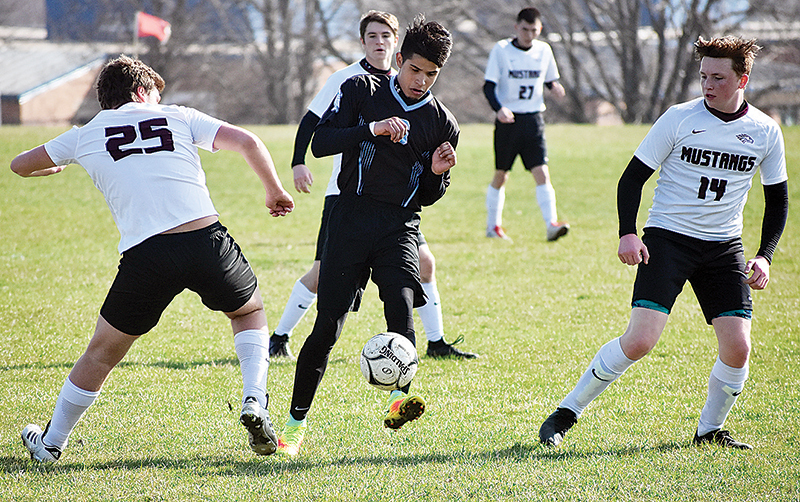 T-R PHOTO BY THORN COMPTON – South Tama County junior Osmar Galvez, middle, splits Independence defenders Jesse Ludwig (25) and Alex Harris (14) during the first half of the Trojans’ 3-0 win over the Mustangs in Tama on Thursday. T-R PHOTO BY THORN COMPTON – South Tama County senior Jonathan Castrejon (9) celebrates after scoring his first of three goals in the Trojans’ 3-0 win over Independence in Tama on Thursday. 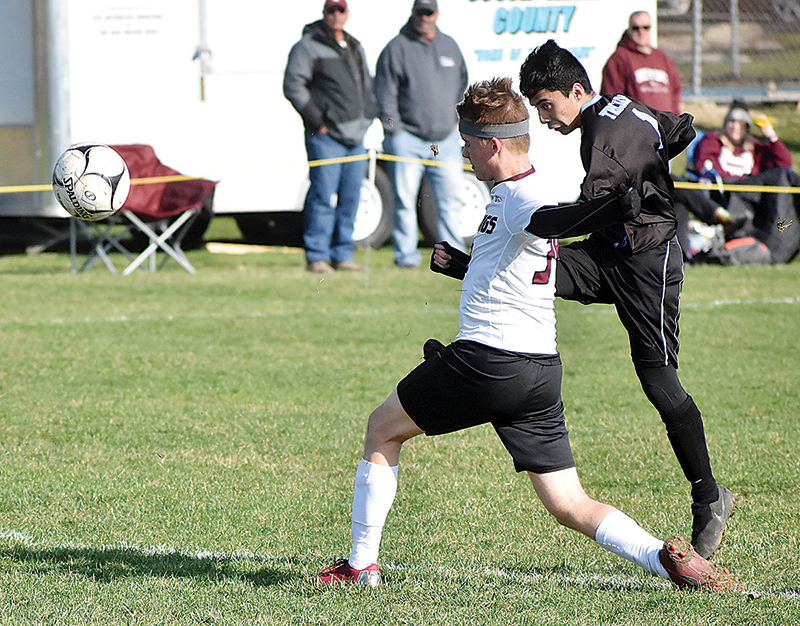 T-R PHOTO BY THORN COMPTON – South Tama County senior Jose Solis (22) dribbles the ball into the box against the Independence defense during the first half of the Trojans’ 3-0 win over the Mustangs in Tama on Thursday.